Boutique Bell tent situated on an elevated platform overlooking the Lake District's stunning Whicham Valley. Our beautiful Bell Tents are set in an idyllic location in the south west corner of the Lake District National Park on a working farm. Sleeping under canvas in our pre-erected Bell Tents. The tents sleep two adults and two children, there is a double bed and a double pull out children’s sofa bed. The tents are fully equipped with a cooker, pots, pans and all the utensils you would require for a relaxing stay. There is a table for dining, fairy lights and of course bunting. Outside there is a fire basin, table and four chairs. Please bring your own sleeping bags/bedding. The showers and toilets are outside the Roundhouse only 20m away and immaculately clean. Enjoy! 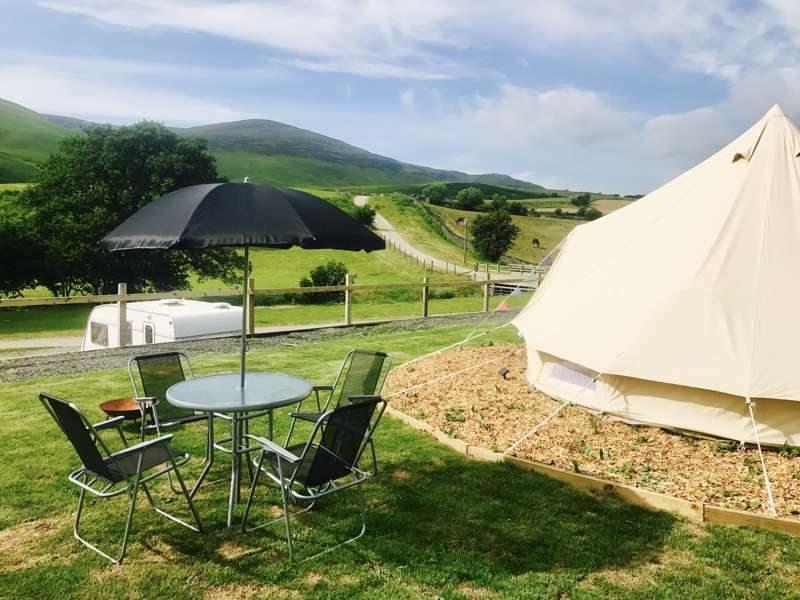 The Bell tents are situated on our campsite on a raised terrace with easy access to toilets and showers as well as washing facilities with hot water. Our site is on a working farm with cows sheep and horses so for health and safety reasons it's not possible to access other areas of the farm but there are some lovely walks directly from the site up onto Black and White Combe. Our nearest beach is only 3 miles away (5 minute drive) with glorious miles of largely unoccupied sand. We are currently developing some areas of the site but would hope that this is not creating any inconvenience to our visitors.